The Chicken Soup Murder is a novel told from the perspective of Michael, a primary school boy (about to move on to "Big School"). Michael lives with his nan in a cul-de-sac in a small town near the coast; his neighbours are a community, the closest neighbours virtually family. However, all is not well in Michael's seemingly idyllic little world. Before the novel even starts, his friend Janey lost her father to cancer - which tumbled her mother into a deep and troubling depression. Then, the dog of his other neighbour, Irma, died. But it's after Irma starts dating a policeman, Shawn Bull, whose son George bullies Michael, that the final tragedy strikes: Irma herself dies, and with her death, the story begins. Told through Michael's eyes, we experience his world in compelling detail. It's 2012: the year of the London Olympics and (later) the scandal around Jimmy Saville. The story moves through time, reminding the reader of events half-forgotten. What a washout that summer was, except for the few weeks of the Games! And, if you follow cricket, you're in for a pleasing series of reminders bringing 2012 back to life. It's not something I've come across before in a novel, yet it works brilliantly. At its heart, The Chicken Soup Murder is a novel about bereavement. Don't get me wrong: it's not a novel of misery. Irma's death was mysterious and sudden and foul play may have been involved, so at least part of the novel is mystery and suspense. A much more important aspect of the novel is its sense of humour, which is a gentle, wry sort of humour. We never laugh at the characters, but we occasionally get chances to smile knowingly or affectionately. However, despite its gentle tone, death, grief and bereavement suffuse the story's fabric in every scene. Janey and her mum have not gotten over the trauma of her father's tragic death. In fact, Janey almost has to mourn both her parents; her mother is that debilitated by her grief. Michael is obsessed with (the circumstances around) Irma's death to a point where his mental health suffers. George Bull, bully to begin with, is crumbling and vulnerable under the stress of his loss. All the relationships between characters become unsettled and fluid as a result of the deaths and the grief that has struck them. What used to be certain is not, and they all deal with this sudden instability in different but entirely believable ways. If anyone told me I'd enjoy a novel about bereavement, I would have concluded that they know nothing about my reading taste at all. And yet I did enjoy the book. It wasn't a formulaic crime novel; it wasn't a whining misery novel; it wasn't a "aren't children quirky" sickly concoction of corny cheese. 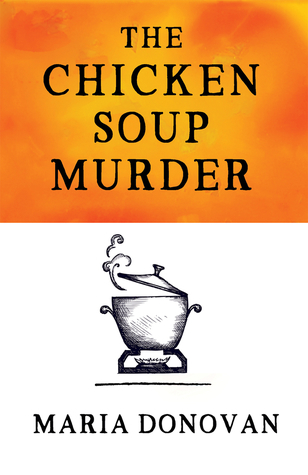 Somehow, The Chicken Soup Murder navigates between these pitfalls to be a warm, addictive, gently amusing novel about the unavoidable, everyday tragedy that is death. It's a literary novel with complexity and authentically human characters. It's not a navel gazing novel; lots of things happen. It's an intelligent novel which does not show off how smart it is, but makes you want to read on to find out what happens next.